Artwork can be viewed at the Silent Jane Salvage Studio in Broadalbin, New York or by Exhibition. Call the studio to schedule a private viewing. Open studio hours vary, appointments recommended. Purchases in this online gallery reserve your item, pending review. 3/25 with Certificate of Authenticity. Gilcee Photo on Fine Art Paper, Wooden Frame, Archival Mat, Low Glare UV glass. *Shipping and handling are additional and NOT included in this price. Buyer will be contacted after purchase with shipping price and invoice, price dependant on zip code. Pick-up at the Silent Jane Studio is always free. Contact seller for additional sizes or unframed prints. There will be only 25 prints of this image produced. The photographer reserves the right to reproduce the image in other forms. These reproductions ARE NOT considered to be originals but may AUGMENT the value of the originals. To see a basic price chart of available photographic paper prints with or without mat or frame, see the photos of this listing. 1/25 artist’s proof with Certificate of Authenticity. 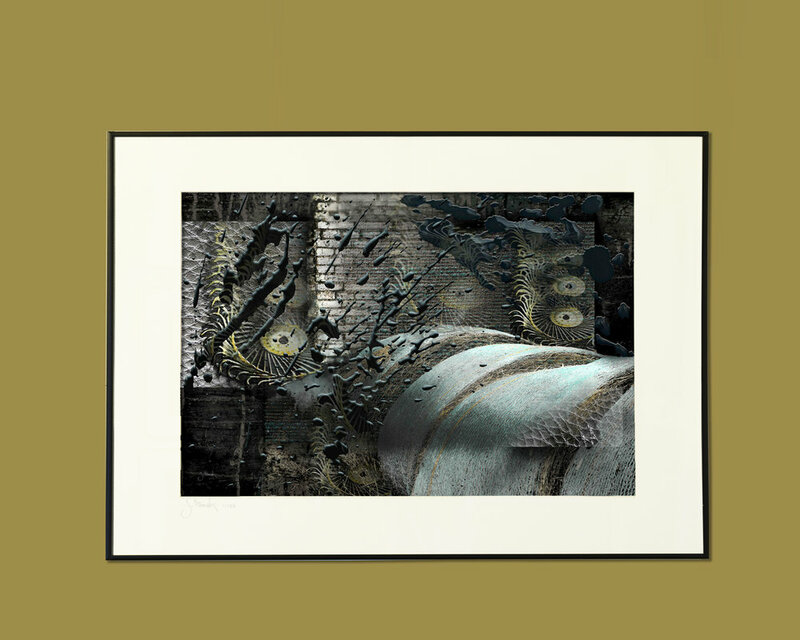 Giclée Photo on Art Paper, Float mounted in Wooden Frame, Archival Mat, UV acrylic. 1/25 artist’s proof with Certificate of Authenticity. Giclee Photo on Fine Art Paper, Wooden Frame, Archival Mat, Low Glare UV glass. 1/25, Artist's Proof with Certificate of Authenticity. 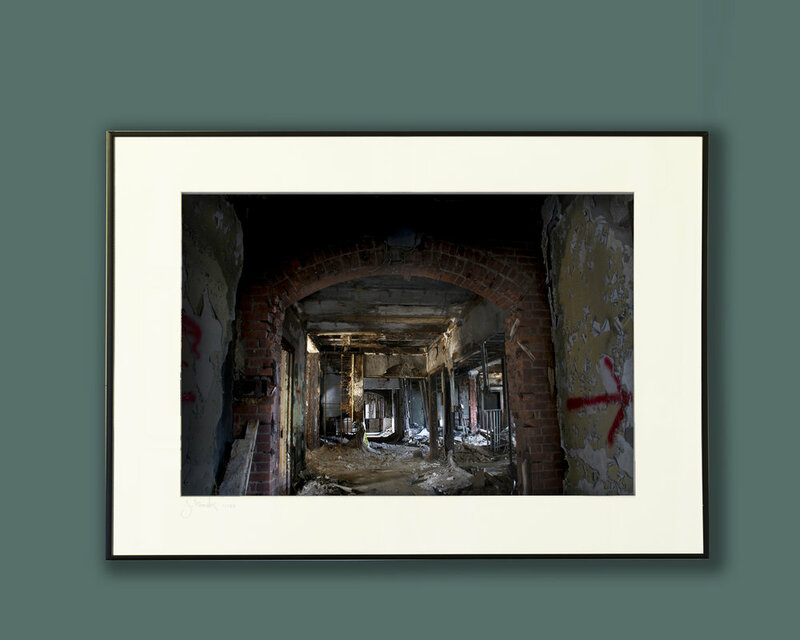 Giclee Photo on Fine Art Paper, Wooden Frame, Archival Mat, Low Glare UV glass. 2/25 with Certificate of Authenticity. 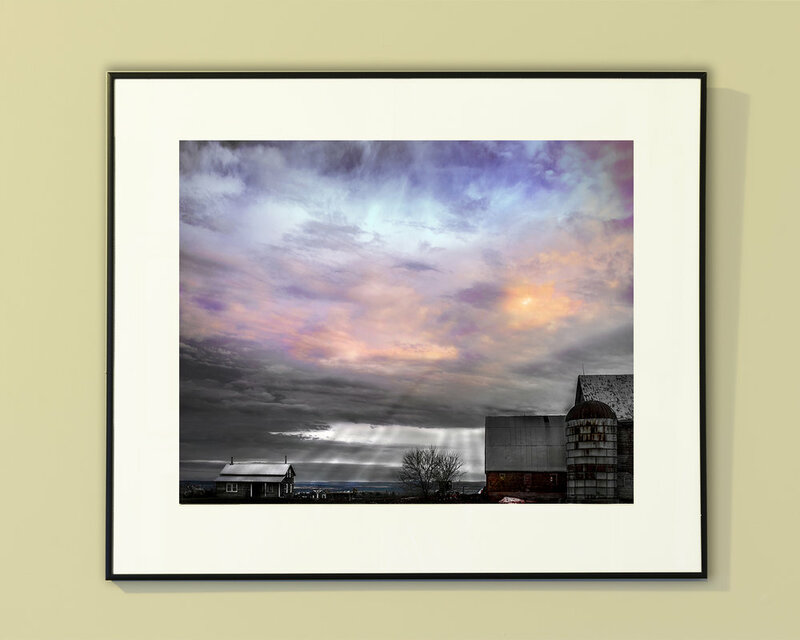 Giclee Photo on Fine Art Paper, Wooden Frame, Archival Mat, Low Glare UV glass. 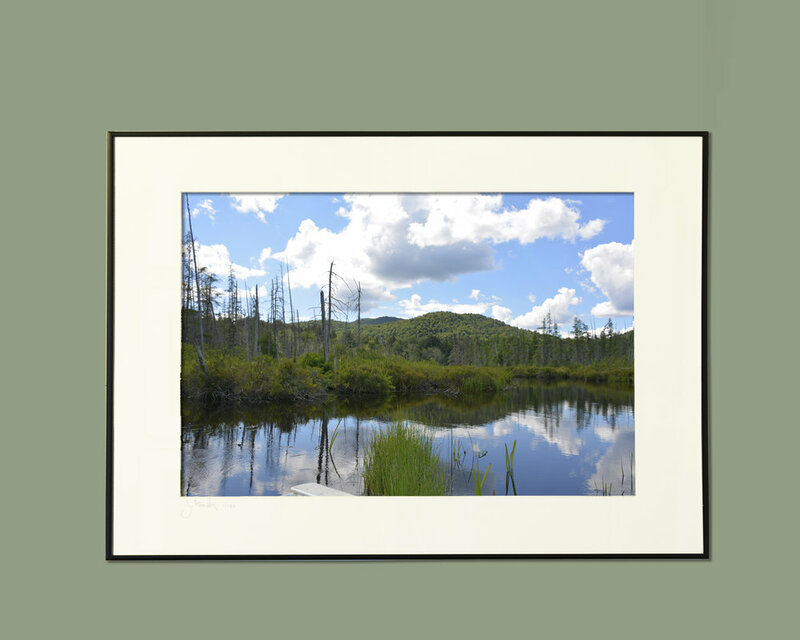 2/25 is available for viewing in the permanent collection of Hudson Headwaters. Giclée Photo on Art Paper, Float mounted in Wooden Frame, Archival Mat, UV acrylic. 3/25 with Certificate of Authenticity available by commission only. The photographer reserves the right to reproduce the image in other forms. These reproductions ARE NOT considered to be originals but may AUGMENT the value of the originals. Existing Work and Custom Design. Artwork available at the Studio by Appointment. Photography, collage, and various art by Janene Bouck is available at the studio or on exhibition. To purchase framed work designed specifically for your decor, contact the studio. An experienced architectural designer and graphic artist, Janene will create artwork specific to your intention. Conceptual photographs, original designs, cardstock, fashion, and decor are all acceptable projects. Custom orders will be estimated as the project is developed. Please describe your project goals. 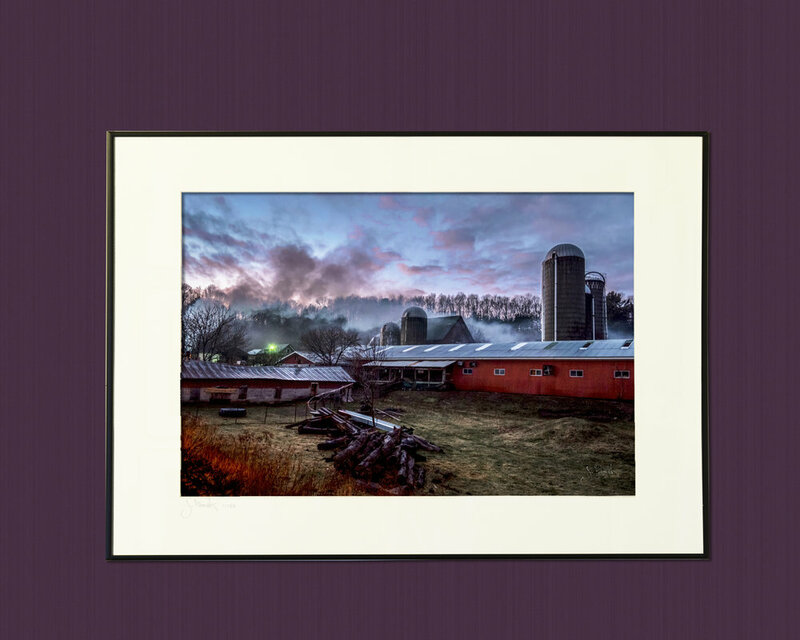 Order archival quality framed Fine Art & Photography by Janene Bouck. Custom orders always welcomed. Limited Edition Custom Framed Fine Art by Janene Bouck. Gallery Style 30" x 22" Frame with textured soft white single matting. 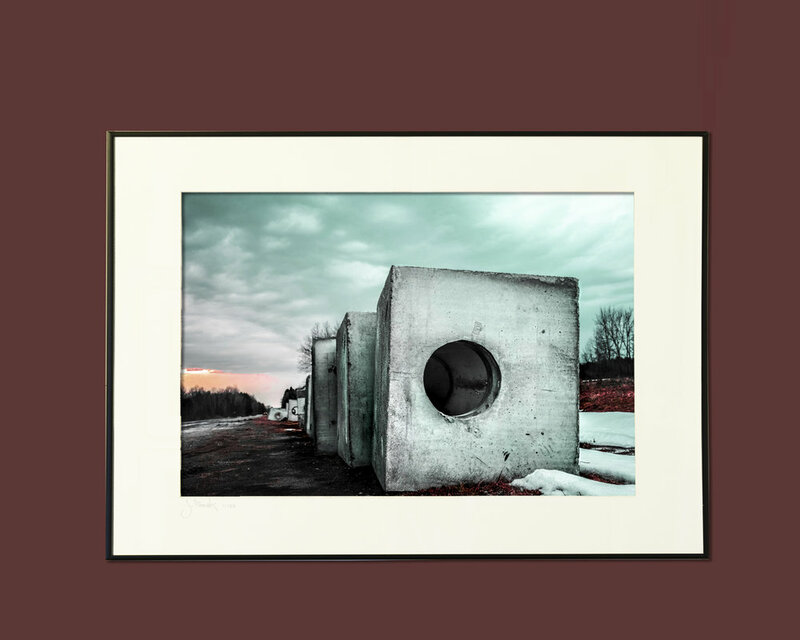 Limited Edition Archival Gallery Framed Fine Art Photographs. Exclusive signed & numbered prints are available in limited number. The image above is shown with a standard black metal gallery frame (measuring 30" x 22" to the outside of the frame) and a soft white textured mat board. This chromira print and frame combination is available for $290.00 plus tax and shipping. These editions are limited to 25, including artist proofs. Artist proofs are NFS. The photographs in this collection are signed, numbered and dry mounted. 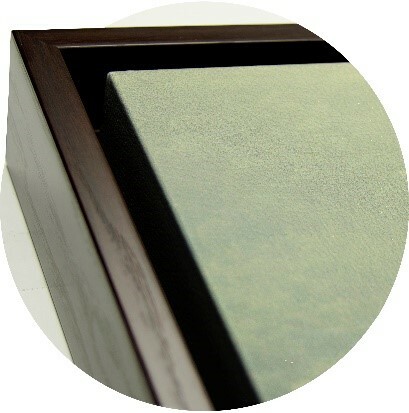 The Black gallery frames are professionally installed to a museum quality specification. The frame contains uv filtering glass and a dry-mounted archival photographic print created using a ZBE Chromira digital LED printer. Prints made on the Chromira feature pinpoint sharpness from corner to corner, exquisite highlight and shadow detail, deep blacks, and accurate color balance. Acid free mat board is always used. All framing subcontractors are chosen for their skill to receive the best product possible for your budget. Preference to small local businesses and the use of local materials is paramount to Janene and is always considered while creating your art. View potential examples of custom framed photography in the sideshow. Any combination of art, mat board color or frame is possible. Custom Gallery Framed Artwork is available by request, please use the form to inquire. Exclusive signed & numbered prints are available in unique frames and mat combinations to suit any decor. 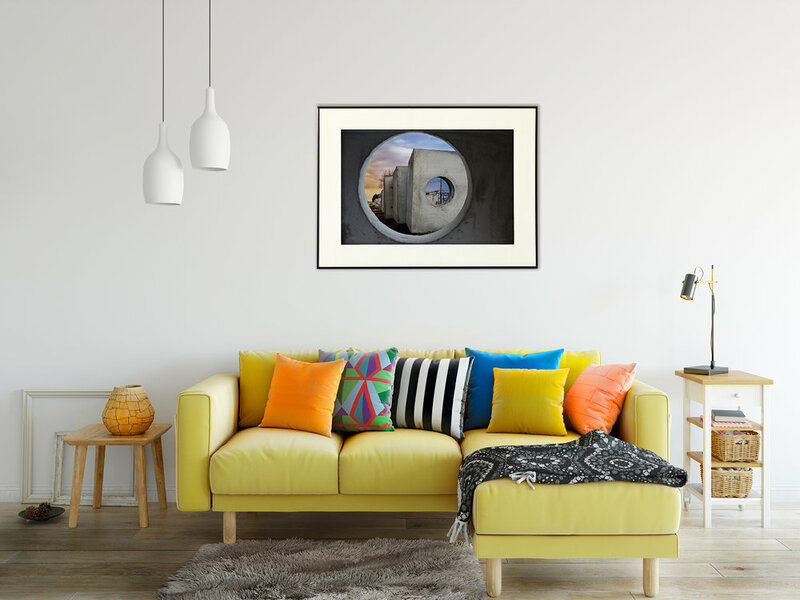 Chromira Prints, Metal Paper, Aluminum Prints, Leather Prints, and Giclee Prints all have their own particular beauty to suit your taste and budget. All are available in custom frames and sizes. Contact Janene at the studio to discuss your custom project. Please complete if you prefer to discuss your project by phone. Name and size of artwork requested. Thank you for your request, Janene will be in contact soon. View the full galleries of Janene Bouck's Photography. Available on 3 archival art papers or canvas. Giclee Prints are beautiful archival-quality prints. Available on archival art paper and canvas. Select from three grades of acid-free fine art paper, Somerset Velvet (255 grams), Hahnemuhle German Etching (310 grams) or Ultrasmooth (250 grams). Canvas options include loose, stretched or mounted giclee printed premium artist grade canvas. Discount options also available, please inquire. 2" Free Border. Premium Artist-Grade Canvas. Giclée Canvas printing is top notch in every respect. Artist-grade canvas is primed with a special matte coating optimized specially for giclée printing. The printer utilizes a 12-color pigment ink technology with a remarkable archival permanence ratings in excess of 150 years. This combined with an advanced color management system ensures highly accurate, consistent color balance that is repeatable time and time again. The wide color gamut, rich saturation, deep blacks, definition and detail make these canvas prints truly stunning. It is then hand coated with a protective varnish. Gallery wraps are beautiful finished works of art – ready to hang. 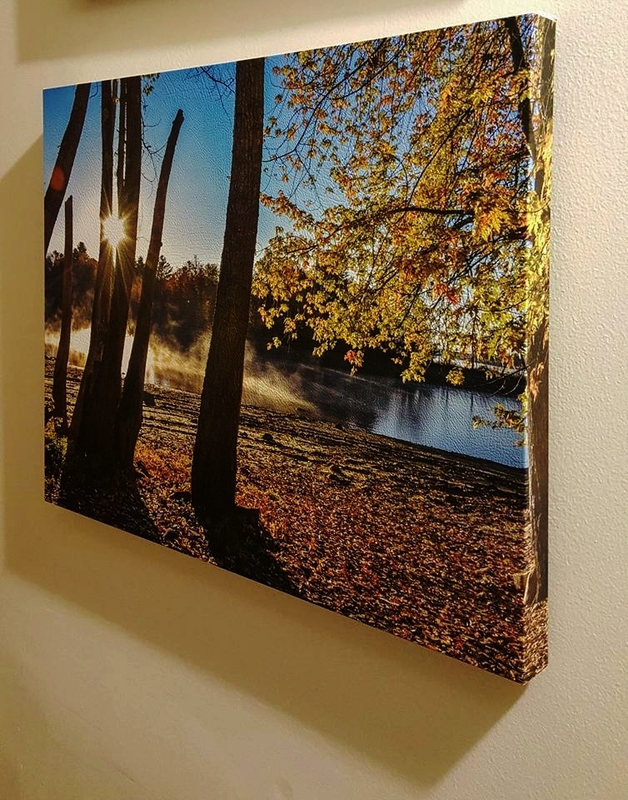 Printed on premium-artist grade canvas, the image is completely wrapped around the sides of a standard ¾” stretcher bars, eliminating the need for framing. All Gallery wraps are finished with a durable clear Satin varnish coating that protects the surface while enhancing the richness and vibrancy of the colors. also included is the wire hanging hardware. 1½” thick stretcher bars and floater frames are available by inquiry. Leather Wrapped Prints provide a unique contemporary display option. The photography will assume the unique texture of leather and display an unparalleled richness in your home. This leather is free of lead, acid and optical brightening agents, allowing the natural beauty of the leather to support the optical richness of the photo. Unframed Leather Wrapped Photography is available in five sizes. 16x16 $68, 16x20 $76, 16x24 $84, 24x30 $104, 24x36 $115. All of the leather is produced in Valencia, Spain. The fiber content of the European Bonded Leather is comprised exclusively of cowhide fibers. The fibers are bonded together primarily by natural latex, a renewable resource harmlessly tapped from Hevea trees. A minimum of 70% of the total content of our leather is leather fiber and approximately 30% is non-leather substances, principally the natural latex. The leather is environmentally friendly and consistent—free of natural defects. The natural latex used in our leather is sealed into the material during the manufacturing process and those with latex sensitivities will not be exposed to the latex within their Leather Gallery Wrap. The leather and inks and are formulated to work together to provide the highest quality, longest lasting product available. My print shop uses an in-house UV test chamber, they continually test our materials to ensure that the color will stand the test of time. 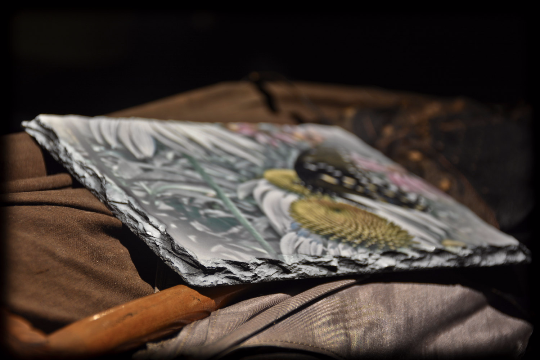 The Leather Gallery Wraps are not coated as the inks are scratch resistant the moment they come off the press and will not fade over time. Leather Gallery Wraps are built with a solid face to support the leather and keep it from warping or loosening. Leather Wraps also come with pre-installed sawtooth hanging hardware and are mounted on a solid black backing. Orders are processes within 7 days. Shipping ia additional. Please see http://www.ups.com/maps/results for a transit time map from the printing zip code, 80501. Please note: UPS Ground transit time is not guaranteed. The map depicts typical transit times, but these may be affected by volume and weather implications. Should you select to upgrade your shipping to UPS 2-Day or Next Day Air service, please be advised that those service days are limited to business days. UPS does not extend to us a weekend or holiday delivery service. Complete if you prefer to be contacted by phone. A one-of-a kind photographic display on natural rock.. Slate Prints are earthy and one-of-a-kind. Each stone slate features a natural shape and texture. No two stones are made the same. Matted Prints, versatile, simple and affordable. Available in white or black mat board. The image is fixed between two layers of board inside a low-static plastic sleeve. Paper is available in three finishes, glossy, matte or metallic. 5" x 7" photos are sandwiched in 8" x 10" board. 8" x 10" photos are sandwiched in 11" x 14" board. 2018 calendars are available in 4 styles. Order yours exclusively through Silent Jane Salvage. Each calendar is custom printed for your order and shipped directly to you. Also available at the studio and select SJS exhibits and vendor events. 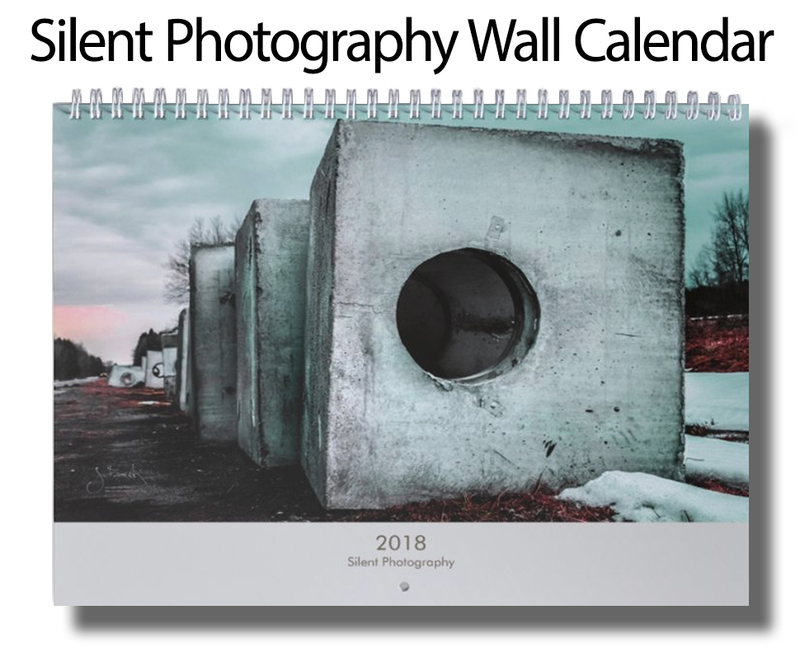 8.5" x 11" Wall 12 month 2018 calendar. 8.25" x 3.75" desk 12 month 2018 calendar. 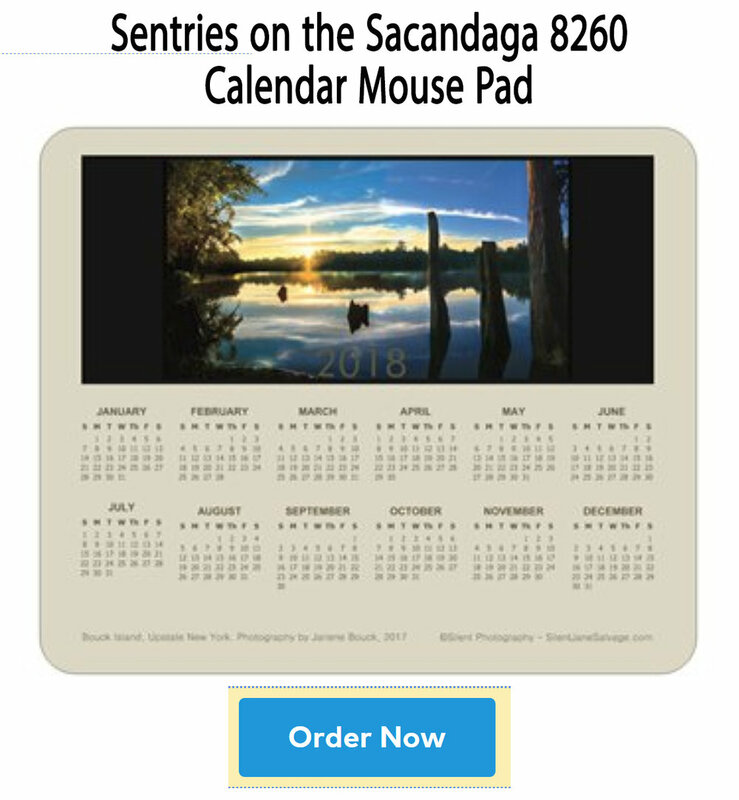 9.25" x 7.5" Mousepad with 2018 calendar featuring "Sentries on the Sacandaga 8260", photography by Janene Bouck. This image was taken in 2017 of the beautiful Sacandaga Lake in Upstate New York. *Prices for odd sized prints will depend on the longest image side. To order your photographic prints, please complete the form below. I will confirm my order by email before production. My payment must clear before my print will be shipped.